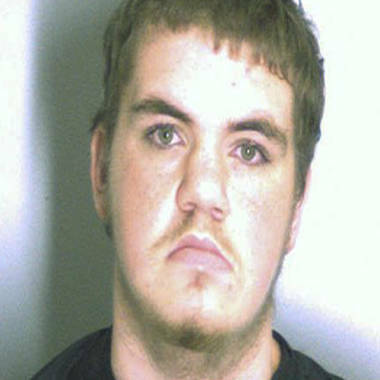 A jail booking photo of school shooting suspect Michael Brandon Hill, 20, in Decatur, Georgia, on Tuesday. Hill is accused of entering the Ronald E. McNair Discovery Learning Academy elementary school, armed with an assault style rifle. A woman who describes herself as the adoptive mother to the suspect in Tuesday's Georgia elementary school shooting said the troubled 20-year-old has "never had anyone there for him," and has numerous "mental issues." Michael Brandon Hill, who according to officials entered Ronald E. McNair Discovery Learning Academy in Decatur, Ga., with an AK-47 assault-style rifle and nearly 500 rounds of ammunition, does not have a biological mother after his own died. But Natasha Knotts, 40, who met Hill three years ago through her husband's church — the Prophetical Word Church in Decatur — considers him a son. "I don't have the papers, but I have the heart," she said. Knotts said people through the church "were trying to help him." Hill has had difficulties with his family. Tuesday's incident, in which authorities say Hill shot about six rounds at law enforcement who raced to the Atlanta-area school before he surrendered peacefully when they returned fire, wasn't his first alleged encounter with Georgia police officers. In December, Hill "threatened to shoot" his brother, Timothy Hill, Timothy said. The threat was on Dec. 30 or Dec. 31, just two weeks after the school shooting in Newtown, Conn., which left 26 people dead, 20 of whom were children. A grand jury charged Hill in March with making terroristic threats for the incident, to which he pleaded guilty. He received three years of probation and was ordered to be evaluated and treated for anger management. In addition, Timothy Hill said his brother was issued a no-contact order, and said the two have not talked recently. Hill is "someone who slipped through the cracks," Timothy said, describing his brother as someone who started "having problems" at age 13. "He had his good times, and then he had his bad times," Timothy said. "He was bipolar and suffered from ADD [attention deficit disorder]." NBC has not been able to independently confirm the diagnoses of Hill. Knotts said his “Medicaid expired, he was unable to get his medicine” to treat his issues. “He didn’t really let anyone know,” she added. DeKalb County lead investigator Ray Davis told reporters at a news conference Wednesday that Hill acknowledged that he had been on medication. "He indicated that he was on medication and had stopped taking it," Davis said. Hill had other personal problems as well this year. Knotts said he came to live with her and her husband for a brief period of time after an apartment fire reportedly left him hospitalized in April. Knotts tried to visit the man who is like a son to her in prison on Wednesday, but was told there would be no visitation hours for him until Friday. When asked how she was handling the news of his arrest and allegations of what he had done, she said simply: "Not good." Hill shared a rental home in Decatur with a woman and her boyfriend and up to three other residents. The woman, who was not identified, told TODAY on Wednesday, "I've been having a rough time. I just pray for him." Neighbors described Hill to the Atlanta Journal-Constitution as quiet and polite, and said he and the other residents moved into the house about a year ago. The residents sometimes threw small get-togethers in the wooded neighborhood but weren't loud, neighbors told the paper. "I'm surprised," Francis Hall, who lives across the street from Hill, told The Atlanta Journal-Constitution. "He's just an average guy." The house is within walking distance of the Ronald E. McNair Discovery Learning Academy. Hill is charged with aggravated assault on a police officer, making terroristic threats and possession of a firearm by a convicted felon for Tuesday's shooting. He was questioned for hours by police, but police have no clear idea of what may be a motive or whether Hill has ties to the school. Authorities said Wednesday that Hill did not own the AK-47-like weapon that was used in the shooting, and that they believed it was taken from the house of an acquaintance of his. Authorities believe that the gun was originally purchased from a licensed dealer and said they were working to locate the gun’s owner, but did not specify whether the weapon was stolen. DeKalb police release a picture of Georgia elementary school shooting suspect Michael Brandon Hill carrying a rifle the same rifle they say he had when he was arrested. Davis said a photo of Hill holding a rifle, believed to be the same one used in Tuesday's shooting, was found on Hill's cellphone. Davis also said just one rifle was recovered from the school, contradicting earlier reports that at least two weapons were found. Hill waived his first appearance in DeKalb Magistrate Court on Wednesday afternoon.